Service members are making their voices heard about a pressing issue impacting the nation’s military through a petition that is quickly gaining steam. No, not readiness concerns, toxic command climates, matters of pay or dwindling morale, but the glaring deficiency on contiguous U.S. military installations of the most pleasurable food chain: the venerable poultry enterprise known as Chick-fil-A. The “Bring Chick-fil-A to military base installations" petition, initiated on change.org by Senior Airman Emily Carby, has accumulated nearly 20 thousand signatures in less than five days, and momentum continues to build after the popular Facebook page, Air Force amn/nco/snco, first shared her petition. Organizations like AAFES would certainly have to get involved, but Carby hopes this will at least be a starting point. One must walk before one can chicken. Service members have grown weary of suffering through cheaper, non-nutritious fast food as one of the sole on-base options, the petition claims. And as the oftentimes solitary healthy alternative, Subway is perpetually packed to the gills with personnel desperate for decent sustenance. The development of five-dollar-foot-long fatigue among service members is a grave concern among today’s junior enlisted. Adding Chick-fil-A to the military’s slow-growing smorgasbord of on-base food options would provide a welcome respite to the stomachs of service members everywhere. How welcome would the chicken chain be? Just listen to the video below, in which Senior Airman Jordan Smith, a KC-10 in-flight refueler from Travis Air Force Base, California, talks to an F-22 Raptor pilot during a refuel while deployed. “I think Chick-fil-A is the biggest thing I miss right now,” the pilot says, dismissing thoughts of loved ones in favor of the irresistible, mouth-watering delicacy. “Yeah, I miss it too," says Smith, longingly. Not only would Chick-fil-A help remedy the military’s current dearth of heavenly cuisine, but the restaurant’s proven track record of excellent customer service, as well as its core values of customer first, personal excellence, continuous improvement, working together and stewardship, would mesh with many of the military’s own standards. 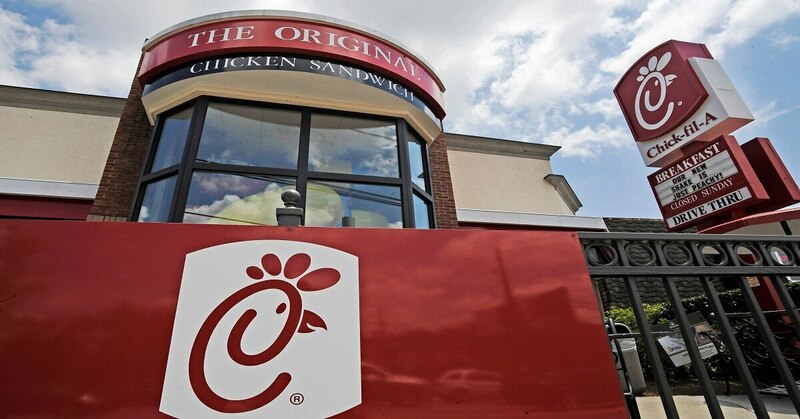 “An encounter on any given day within a Chick-fil-A restaurant is full of manners, smiles and ‘my pleasures,’ which could raise the morale and warm the black hearts of even the crustiest,” the petition says. Would you welcome Chick-fil-A to your base? Tell us what you think in the poll above. These guys really like to chat about food..